Summer in Chennai is quite brutal. Days are long with temperature in the 110s and humidity greater than 85%. Scorching sun, sweat pouring in rivulets, erratic power supply and water scarcity are some things that come to my mind when I think about it. But summer also means juicy mangoes, fragrant jasmines and water melons. At least there is something to look forward to. Anything cool and refreshing is a welcome relief. So, my mom used to make yogurt vermicelli for dinner, which she learnt from my Aunt U. Cool yogurt and fruit along with creamy vermicelli is like a pudding, sweet and savoury, together. Vermicelli was always preferred over rice for dinner. This was one of those meals we never complained about. 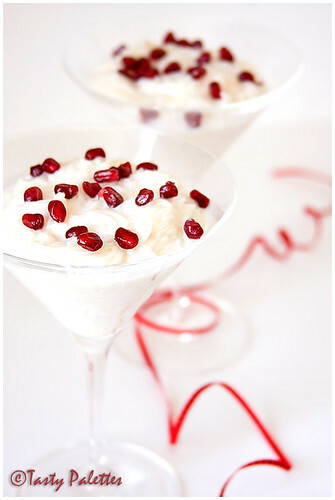 Pomegranate is my favourite fruit in this recipe, followed by grapes. You can season with mustard seeds, but I like to keep it simple and sweet. This is my entry to Sra’s AFAM – Pomegranate. Dry roast vermicelli for a couple of minutes. Boil 6 cups of water and cook vermicelli for about 3 minutes, until it is cooked through. Drain using a colander and rinse vermicelli in cold water. Return vermicelli to the pot, mix with yogurt and salt. Refrigerate until served. Mix pomegranate or grape halves just before serving. Edited to Add: Mansi at Fun and Food, is hosting WBB - Balanced Breakfast this month. She graciously asked me to send this to her event. I am more than happy to, Mansi. Baking is an exact science, they say. But that didn’t matter to me. When my baking experiments with cardamom became more than successful (I have made these turnovers countless number of times now), I wanted to bake a cardamom-flavoured quick bread. While putting this recipe together, I had no recipe in mind, but a flavour – Gajar halwa or carrot halwa. So I added a little bit of this and little bit of that and ended up with one of the most amazing creations of mine. The muffins were moist and delicious, that every bite was a treat. To make this enjoyable for everyone, I made ‘em vegan. Flax seeds were used for eggs and Tofutti, better than cream cheese for frosting. I was quite impressed with this vegan cream cheese, it is as good as its dairy counterpart. Herbs and chives is my favorite spread for sandwiches these days. This is my second entry to WBB – Healthy Eats. A quick reminder, the deadline for this event is 29th of this month. Preheat oven to 400F. Line muffin pan with liners. In a big bowl, microwave 6 tbsp of water till it boils. Vigorously whisk in ground flax seeds. Microwave for a minute, whisk again and microwave for an additional minute. To the ‘flax eggs’, add oil, sugar, vanilla and cardamom and beat until creamy. In a separate bowl, mix all purpose flour, baking soda and salt. Add dry ingredients to wet ingredients along with crushed pineapple. Toss carrots, raisins/currants and cashew/walnut in the remaining tbsp of flour. Add this to the batter. Mix until combined. Scoop batter onto muffin cups and bake for 20 minutes at 400F. Reduce the oven temperature to 350F and continue to bake for another 25 minutes, until a toothpick comes out clean. Cool on a wire rack and serve warm. 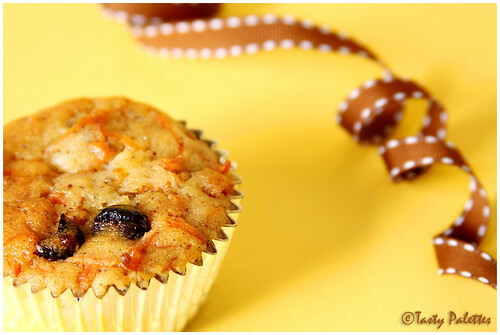 This recipe yields 11 standard size muffins. If desired, prepare frosting by creaming cream cheese and powdered sugar together. When cupcakes are cool, frost them. Deeba, The Passionate Baker and Maya at Konkan World have awarded me with ‘Nice Matters Award’. “Nice Matters Award is for those bloggers who are nice people; good blog friends and those who inspire good feelings and inspiration. Also for those who are a positive influence on our blogging world.” This means a lot coming from my fellow bloggers. I want to express my appreciation for passing this award to me. Thank you Deeba and Maya. If you have come here looking for gnocchi, you would be disappointed. But I have something even better, the Indian pillows of heaven - the ubiquitous Idly. If you ever step inside a Tamilian’s house, idly and sambar is sure to be on the breakfast menu. Idly is as ancient as the Tamil culture itself. The reason is quite simple. Its tasty and light on the stomach. If you are feeling under the weather, the physicians in South India would suggest idly and rasam. Idly is easily digestible and like the Amish Friendship Starter, it relies on natural fermentation. The task of making the batter right may seem daunting. But with a little practice and patience, it is very achievable. Once you have the right formula for the batter, then breakfast or dinner is a cinch. I am giving some pointers that I find useful when making idly. Always grind urad dal first. Also refrigerate urad dal before grinding. Both of these steps assure fluffier urad batter. If you forget to refrigerate the dal, then grind using ice cold water. If you have issues fermenting batter in your house, try keeping the batter in an enclosed area, like microwave or oven, before going to bed. If you still have issues with batter rising and fermenting, warm the oven lightly at the lowest setting possible for half an hour. Then keep the batter and close the door. Check after 5 hours to see how much it has risen. Repeat warming the oven once again if necessary. While trying to make the batter for the first time, try watching it during the day. Because once you keep it inside the oven and go to bed, it may rise and spill inside your oven. And you will end up cleaning the oven first thing in the morning. Each sack of rice and dal is different. Hence adjust the rice:dal ratio accordingly for fluffy idlies all the time. If the batter is tight or if urad dal is not enough, idlies turn out hard. If the batter is watery or if there is excess urad dal, the idlies fall flat. I use Ultra wet grinder for making idly/dosa batter. You can also use Indian mixers like Sumeet or Preeti, although you have to do it in small batches. If you don't have either one of these, then try your blender. Western food processors are, sadly, not fit for the job. Soak rice and urad dal separately for at least 4 hours to overnight. 20 minutes before grinding, refrigerate urad dal. When ready, grind urad dal first in a wet grinder. Grind until the mixture is smooth and fluffy. Transfer to a big vessel and return the grinder to the base and grind rice in two batches. The rice should be ground fine and the mixture should not be watery. Add this to the urad dal batter along with salt. Mix thoroughly with your hands till everything is homogeneous. The consistency should be like pancake batter. Make sure the batter has room to double. Cover and set aside in a warm place for 8 to 10 hours depending upon the weather. When doubled, refrigerate the batter. The same batter can also be used for making dosa. 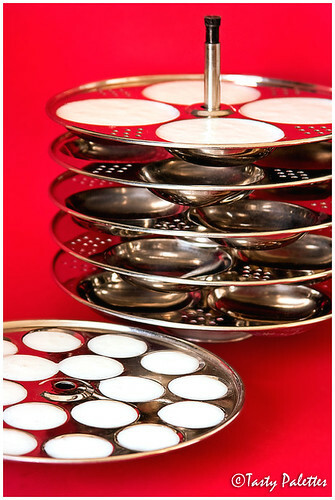 For making idlies, idly plates as shown below are used. They are perfectly designed for efficiently steaming large quantities of idlies. They are available in sets of 3, 4 or 6 plates. Though they are primarily used for steaming idly, I also use them for steaming paruppu usili mixture and dumplings. Lightly oil the plates with sesame oil. Fill batter 3/4th full, giving room to rise while steaming. Stack plates one on top of the other. Take a pressure cooker with some water for steaming, about 2 inches. The water level inside the pressure cooker should not touch the bottom idly plate. Transfer the whole stack of idly plates filled with batter into the cooker. Cover cooker with the lid, but don’t use the weight that comes with the cooker. Put the cooker over medium-high heat. Once you see steam coming through the lid, set the timer for 13 minutes. After 13 minutes, switch off the flame and let the cooker rest for 5 minutes. Take the plates with cooked idlies out, and let it cool down for 10 minutes. Beware of the escaping steam. Remove idlies from the plates and serve hot with chutney and/or sambar. 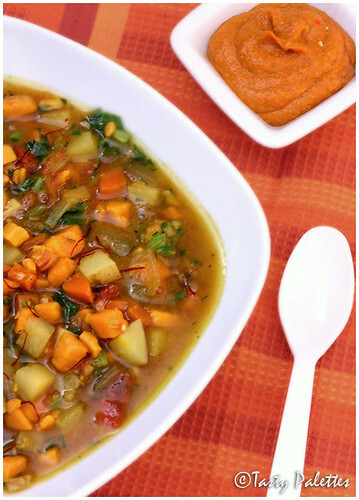 Sambar is served as a condiment with light meals like idly, dosa, adai or upma. It is also served as a main dish and is eaten with rice. Onion sambar, which is my favourite, suits both. Since the spices are ground fresh, it is called ‘Arachu vitta sambar’. Roast all of the above, except onion, in a tsp of oil. Grind along with onion to a smooth paste. In a vessel, boil a cup of water with tamarind, turmeric and salt, until the raw smell disappears. Add the ground spice mixture and cooked dal and mix well. Bring it to a boil over medium heat and boil for 5 minutes. In a pan, heat oil and splutter mustard seeds. Sauté sliced onions and curry leaves for a minute. The onions should still retain their crunch. Add this to the sambar along with cilantro. Mix thoroughly and serve with idly. One of the major complaints about idly is it’s a lot of carbs. Portion control is my answer. 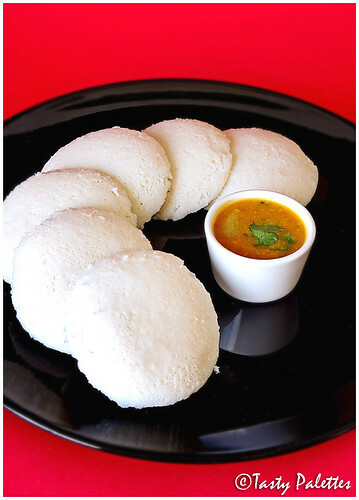 I have these mini idly plates which make, well, mini idlies. The whole plate of mini idly holds batter equal to that two idlies. This along with a bowl of lentil and spice laden sambar, gives me a feel that I am eating a lot. Plus, its so cute. These little pillows of heaven along with sambar is my entry to Weekend Breakfast Blogging - Healthy Eats. Tasty, filling and enough carbs and protein to get me through the day. A Beautiful Bowl Of Soup by Paulette Mitchell is one of the cookbooks I refer to regularly. This book is a collection of amazing soups that fit all seasons. Chunky or creamy, dumplings or dessert, hot or cold, this book has it all. The recipes call for simple ingredients, which when put together in a single pot, works like magic. Well, that’s what soups are, one pot wonders. I set out to try a soup from this book, which interestingly calls for three types of potatoes. But what drew me toward this recipe was the topping – Rouille. 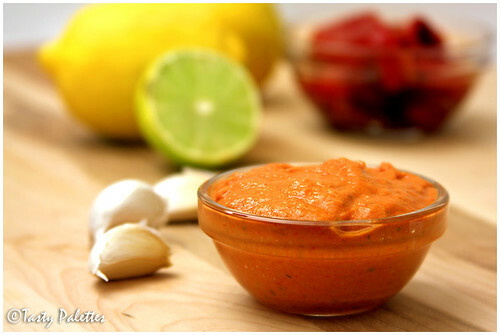 A sauce, which means rust in French, is typically served with fish soup or Bouillabaisse. It is made with breadcrumbs and saffron or red pepper for colour. I was bowled over by how creamy it was. If you like aioli, then this sauce (more of a paste) is a must try. 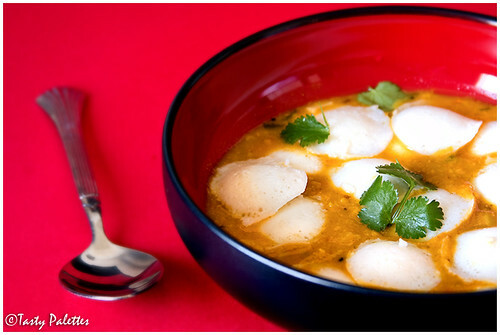 The fresh garlic explodes once it touches the hot broth and the sauce melts turning the soup chunky to slightly creamy. Rouille is as tasty and creamy as aioli, but without the calories from mayonnaise. Take bread crumbs in a bowl and sprinkle a tbsp of water. You can also use the water from the jarred roasted bell pepper. Mix well, until it is crumbly and not soggy. Blend the crumbs with the rest of the ingredients given above, without adding extra water. Blend till smooth and set aside to allow the flavours to blend. Soak saffron threads in a tbsp of hot water. In a large pot, heat oil, and sauté onion and garlic, until soft. Add all the other ingredients except Chinese celery along with 4 cups of water. If using celery, add now, but reserve parsley for garnish. Cover and let the pot simmer for about 15 minutes, until the vegetables are soft. Remove green chillies, stir in Chinese celery or parsley, and check for seasoning. To serve, ladle the soup into a bowl and dollop rouille on top. This is my entry to Potato Fe(a)st, hosted by Dhivya Karthik of Culinary Bazaar. This bowl also goes to No Croutons Required hosted by Lisa at Lisa's Kitchen and Holler at Tinned Tomatoes. No Croutons Required is a new monthly soup and salad challenge. By now, many of you know that my entry for Click – Liquid Comfort, won overall second place. While some of you guessed how the shot was staged, many of you were intrigued. To resolve the mystery, I decided to post the original staging of the shot. Click, conceived and hosted by Jai & Bee at Jugalbandi, focuses on food photography based on a monthly theme. Many thanks to the judges and congrats to other winners. With root vegetables abundant during winter, I regularly bake ‘em and serve with a side of grains. Needless to say, this recipe is very easy and rustic. Cut the vegetables into big chunks, mix with seasoning and herbs, and slide into the oven. While the vegetables are baking, take care of the carb. Serve as a quick, but filling, lunch or supper, on weekdays. There are umpteen recipes for root vegetables bake. But there are few things I want to discuss about this combination. In addition to eating right, I monitor our sodium intake very seriously. According to American Heart Association, our daily sodium intake should be 2300 mg, which translates to a tsp of salt. While I am no where near the perfect number, I reduce sodium sensibly in my day-to-day cooking. To achieve this, I use a combination of salt substitute and salt free seasonings. Salt free seasonings are pre-mixed herbs, that add flavour without sodium to the dish, hence no compromise in taste. There are many herb blends offered by different brands. Choose what appeals to you. My favourite choice is Mrs.Dash – Original Blend. Another option is using salt substitute. Salt substitutes are essentially potassium chloride, as against to sodium chloride in table salt. It is particularly helpful for people with high blood pressure, who need to keep their sodium intake under control. But, I strongly recommend consulting your physician before including salt substitute in your diets. If your body cannot handle potassium, then this may prove to be fatal. I also find that salt substitutes have a slight after-taste, hence I use this in conjuction with table salt. The brand I use Morton salt substitute. Clockwise from top left: Sweet potato, Red onions, Carrot, Potato, Tomato, Sage, Breadcrumbs. I used fresh breadcrumbs made from garlic and sun-dried tomato bread. Take potato, sweet potato and carrot in a bowl. Toss the vegetables with half of the oil, chopped herb, Mrs.Dash and pepper. In a separate bowl, mix breadcrumbs with the rest of the oil. 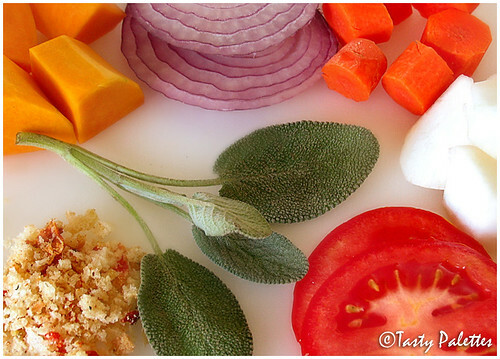 In a loaf pan, transfer the seasoned vegetables. Top it with a layer of onion, followed by a layer of tomato. Finally, spread breadcrumbs evenly, which provides texture and crunch. Bake for 35-40 minutes, until the vegetables are cooked through. 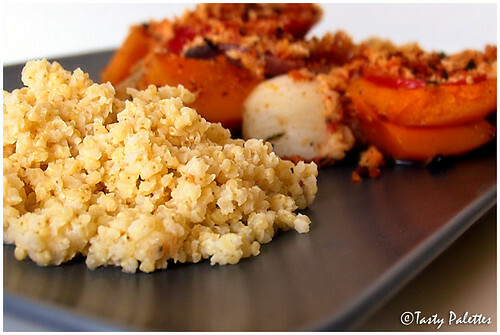 Serve hot with your choice of carbohydrate like rice, quinoa, millet or couscous. To make this a balanced meal, I include a side of carbohydrate, but this is optional. 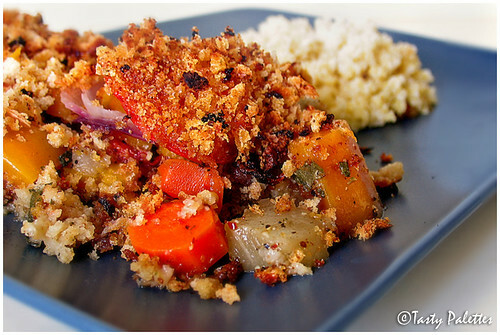 With any vegetable bake, quinoa was always my first choice, followed by brown rice. When I am short on time, I also make whole wheat couscous. 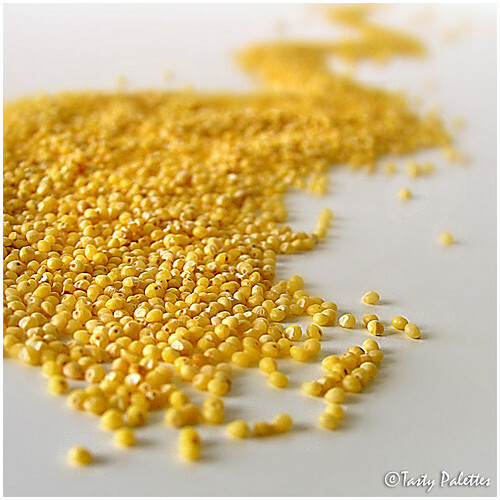 But, after seeing this post of Indira’s, I was quite intrigued with what millet is. I was surprised with what found. Pressure cook millet with water for 2 whistles. Once the pressure is released, let the grains cool for about 5 minutes. Fluff with a fork and serve warm. If cooking on stove-top, bring water to a boil and add millet. Cook covered for about 25-30 minutes, without stirring in between. The grains will turn translucent and soft once cooked. Fluff and serve. Millet is slightly chewy and nutty, and is available in bulk bins at Whole Foods. Check out foxtail millet upma at Vindu. Apple-Cinnamon seems to be the most popular combination around here. From pies to cookies, and fresheners to bath soaps, this is one combination that never goes out of style. I understand that apple-cinnamon evokes a festive mood, and reminds us of holiday season. But it gets on my nerves to find the same flavour over and over again. Don’t get me wrong, I do love cinnamon. Only that I prefer using it in savoury dishes than desserts. To break out from this monotonous practice, I made apple turnovers with cardamom. I grew up savouring cardamom, as most of the Indian desserts call for it. I knew we would love these even before I started, and right I was. The temptation was too much, that two of 'em were gobbled before I could take a picture. If you think apple-cinnamon is the eternal combination, give cardamom a try. You will know what I am talking about. 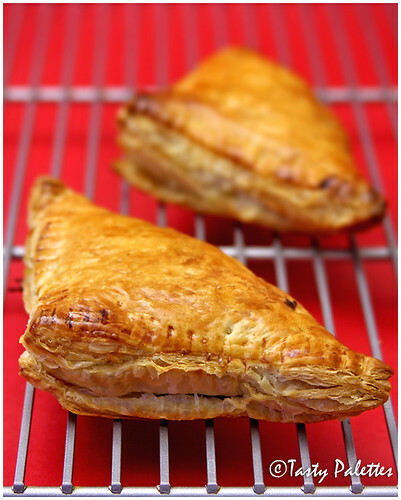 I have already made these turnovers thrice and the last time I made it using tsp spices. Few weeks back, Jaden at Steamy Kitchen, invited fellow bloggers to test this product. tsp spices packages and sells organic spices by the teaspoonful. So every time you open a packet, the rest of the box remains fresh and sealed. I volunteered to test cardamom with this recipe in mind. The package was too pretty to open. I also found the cardamom seeds were neither whole nor finely ground, which is what I expected. The spice was fresh, aromatic and convenient to use. So if you like a well-stocked spice rack that remains fresh for a long time, tsp spices may be the solution you are looking for. Preheat oven to 400F. Thaw puff pastry according to package instructions. Peel, core and thinly slice. If using whole egg, beat the egg with a tbsp of water for egg wash. In a skillet, melt butter, add apples and sauté until soft, about 5 minutes. Sprinkle 2 tbsp of sugar, cardamom, cloves and lemon juice and stir for another minute. Remove from heat and let cool. Cut puff pastry into 4 squares. Brush the edges with egg wash. Place 1/4th of the filling in each of the squares and fold over to make a triangle. Press the edges together with a fork to seal. Transfer to baking sheet and brush the top with the remaining egg wash. Sprinkle the rest of the sugar over the turnovers and bake for 10 minutes. Lower the oven temperature 350F and bake for additional 10-15 minutes until the turnovers are golden brown and puffed. When done, cool on a wire rack for 15 minutes and serve warm. 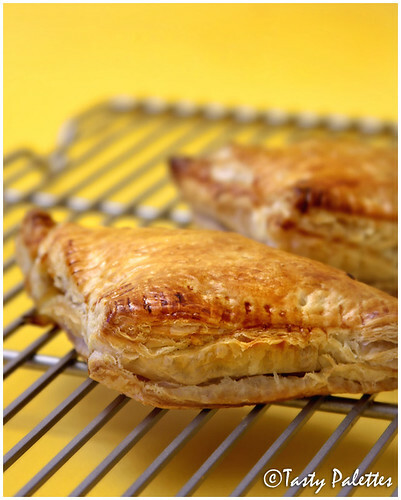 The turnovers can be stored at room temperature for 2 days. Ground spices can be prepared at home. But with cardamoms, the tough skins are not that easy to crush or grind. Sure you can use and save skins to be used later in tea or curry. But I find this inefficient. Instead, I follow what my mom does. 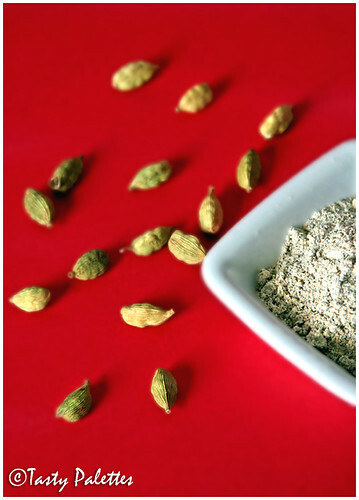 As I said earlier, cardamom is used in many Indian sweets prepared during festivities. Hence, before the start of the festival season, my mom grinds a handful of cardamom with a tbsp of sugar in a spice grinder. The sugar provides enough friction to grind even the skins to a smooth powder. If stored in an air tight container, this remains fresh for 6 months. This way, the cardamom skins are used as efficiently as the seeds. Just a tsp to tea or curry would suffice. 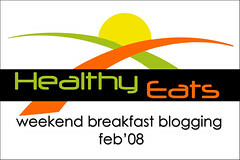 Weekend Breakfast Blogging, the acclaimed food event started by the talented Doc and cognizant nutritionist, Nandita at Saffron Trial, comes to Tasty Palettes this month. Thank you Nandita, for this wonderful opportunity. What is better than having a satisfying first meal of the day? Having one on the weekends. Winding down from the previous week and getting ready to face the next week, its important to sit down, relax and spend quality time during weekends. Having a hearty breakfast during weekends gets me into vacation mood – lazy and relaxing. It also gives me ample time to think and execute a special lunch, amidst other weekend activities. Though it sounds like an occasion to indulge, I make sure it is healthy. Past editions of WBB have been centered on various different themes - interesting and challenging. But this month, I will not bind you with any theme, as such. It can be of any cuisine; sweet or savoury; baked, steamed or sautéed. Although, there is one condition, it has to be healthy. ‘Healthy’ is a relative term. What one views as healthy, may be bland in others standards. For example, I may see egg yolks as 70% cholesterol, while someone else may look at it as 3g of protein. Hence, I ask you to be the judge of your own recipes. Meals that are balanced and include various different food groups like fruits, vegetables, whole grains, low-fat dairy products, etc are welcome. That being said, I invite you all to participate in this edition of WBB – Healthy Eats. Please keep in mind the following rules while participating in the event. Prepare a dish that is nutritious, well-balanced, healthy and can be served at breakfast. Only vegetarian/vegan entries, please. Post about it in your blog during Feb ’08. Provide a link back to this announcement and feel free to use the logo. Email your entry to tastypalettes@gmail.com , with WBB – Healthy Eats in the subject line. Enclose a picture of your entry, if any (250 pixels wide, height does not matter), with your email. If you don’t have a blog, please email me your recipe and picture. The deadline for this event is Feb 29, 2008 (it’s a leap year, remember?). The roundup will be posted during first week of March ’08. Looking forward to receive your inspiring creations. For last month’s WBB edition, visit Rajitha at Hunger Pangs.